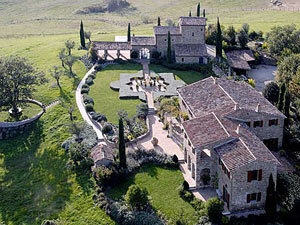 Belvedere is one of ten 5-star luxury villas available to rent on a private estate of Castello di Reschio. This private estate covers 2,000 acres of Umbrian countryside with expansive views of rolling hills, olive groves and vineyards and forests of ancient oak and chestnut trees. Little has changed since St. Francis of Assisi preached here in the Middle Ages. Scattered within this pristine landscape are some 40 farmhouses that seem as ancient as the hills. To date, a dozen or so have been beautifully restored to create private homes, tailored to individual tastes in a style and quality of finish that meets the highest international standards. Each home is unique and has been created and furnished by the owners, Count Antonio Bolza and his family who live in the 11th century castle and run this magnificent estate. Castello di Reschio is owned by a prestigious family with three generations directly involved in the master planning, architecture, design and interior design of the estate Integral to Reschio is a combination of world class service facilities, privacy, security and nature at its most tranquil. The 5-star concierge service available includes in-house cooks, personal drivers and daily maid service. Residents can enjoy classic Umbrian food in the delightful setting of the private Osteria providing light meals to all guests of the estate, horseback riding, tennis, mountain biking and country walks on the estate. Castello di Reschio is well placed to enjoy the highlights of Umbria and Tuscany and is only twenty minutes from Cortona and half an hour from the galleries, churches, theaters, and opera, film, and jazz festivals of Perugia. Siena, Arezzo, Assisi, Todi and Orvieto are all close. Florence and Rome are within a two-hour drive. Using reclaimed materials each property is a work of art, reflecting the colors of the Umbrian landscape. Mosaic floors, stone, terracotta, beams and shutters provide a stylish template to the rooms, with space used to maximum advantage and promoting the natural attributes of the property. Windows and terraces provide ever-changing pictures of the magnificent landscape. Castello di Reschio's landscape architects ensure that each and every garden becomes an integrated landmark within the estate while blending with the classically rural surroundings. Some gardens might be formal with terraces of lavender, santolina and salvia, while others remain natural, merging with the surrounding landscape of olive groves, umbrella pines and cypress trees. Belvedere was meticulously restored to the very highest standard of renovation and design incorporating all the most efficient modern systems and yet using traditional materials. The fresco painted dining room, the trompe d'oeil painting and reclaimed terracotta tiles give this traditional Umbrian farmhouse more sophistication. Entrance hall leads to a large living room with doors that open to a courtyard with a fountain, a dining room with ancient frescos, and another living room with painted wall decorations and piano. A fully equipped kitchen and a French bedroom with en suite bathroom and access to the gardens complete this floor. Cantilevered steps lead to the first floor and a large master suite including a double bedroom with windows on three walls that offer panoramic views of the surrounding countryside. The suite also contains a separate study with fireplace and outdoor staircase to the garden, and a large en suite bathroom with bathtub, double shower and double sinks. A double bedroom with en suite shower room and a double/twin bedroom with en suite bathroom round out this floor. Enter into a fresco painted garden room with access to a well equipped summer kitchen, pool changing and shower rooms, laundry room and Maid's quarters. Up the stairs, there is a double bedroom with en suite bathroom and a guest shower room. Up another flight of stairs is a double/twin bedroom.